When you need crampons, an ice axe, camping gear, canoes or kayaks you really need them! – but for the rest of the year they just take up space. Camping is a fantastic activity with family or a group of friends especially if it is linked to a journey by paddle or on foot – whether this is for a simple overnight or a multi day wilderness expedition into the wilds. From tents to sleeping mats and stoves to sleeping bags and dixies we have the equipment you need to do it in comfort. If you can’t find what you want – then just let us know ……… 2 – 4 man tents, karrimats, sleeping bags, camp stoves & gas, cooking sets, KFS sets, torches (batteries extra), camping lights (plus gas), midge candles, midge nets. Equipping an expedition, whether for a Duke of Edinburgh Award or heading off into the wilderness under your own steam can be extremely time-consuming and expensive. We can supply the kit & advice you need, picked up from our base just outside Fort William and at a fraction of the cost of buying it. This will also give your group the opportunity to try gear before investing in gear of their own. Items are available to hire on an individual basis or as a package. We also have access to expedition food packs – menus are available for pre-orders. 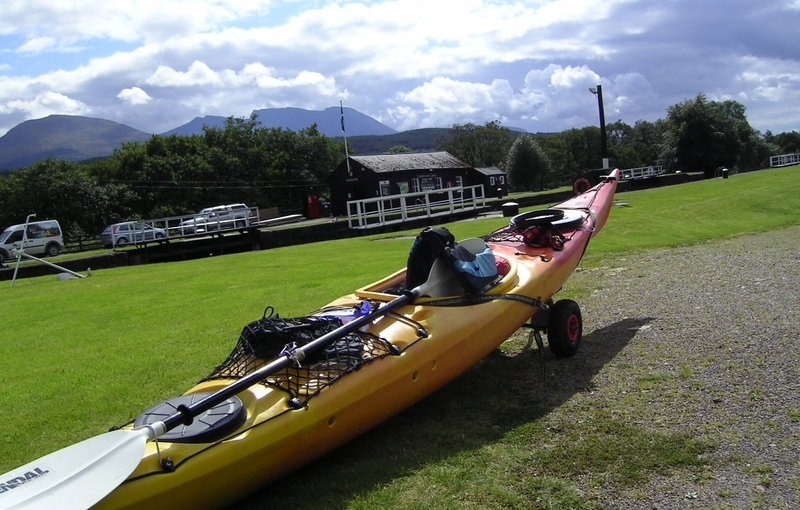 Snowgoose Mountain Centre offers one of the most comprehensive services in Scotland for open canoes, river & sea kayak hire and are available for hire on a 1 or multiple day basis – there is a half day (3 hour) minimum charge. All hire prices include as standard paddles, spray decks where needed, & mandatory buoyancy aids. Save yourself the hassle of trailing kayaks or canoes up here to Scotland or the expense of owning a boat if you use it only once or twice a year. We can provide you with everything you need to get on the water without fuss and in safety. Canoes / kayaks are picked up from our base just outside Fort William at Corpach where you will be fitted with buoyancy aids & paddles. While we are happy to hire to couples, families, groups of friends & Duke of Edinburgh Award groups at Silver & Gold levels all of your group should have sufficient and relevant skills & experience to look after yourself and others in the group. A full shuttle service can be provided for canoes & kayaks plus gear & bodies from locations further away i.e. more than 5 miles from our base with very little hassle. A pick up for your group from Inverness, Glasgow or Edinburgh Airports can be arranged with a local company. In addition to our boats, you can also hire: extra barrels; trolley wheels; tents, karrimats, sleeping bags, camp stoves & gas, cooking sets, KFS sets, torches (batteries extra), camping lights (plus gas), midge candles, midge nets. When you need crampons and an ice axe, you really need them – but for the rest of the year they just take up space. Save on clutter by hiring from us when you need stuff and bring it back when you’re done. If you are not sure if this is the sport for you then do not go out and spend hundreds of £s on new gear. Beg, borrow or ……. Charity shops and (increasingly) e-bay are a good source of realistically priced mountain gear – but you do need to know what you are buying. 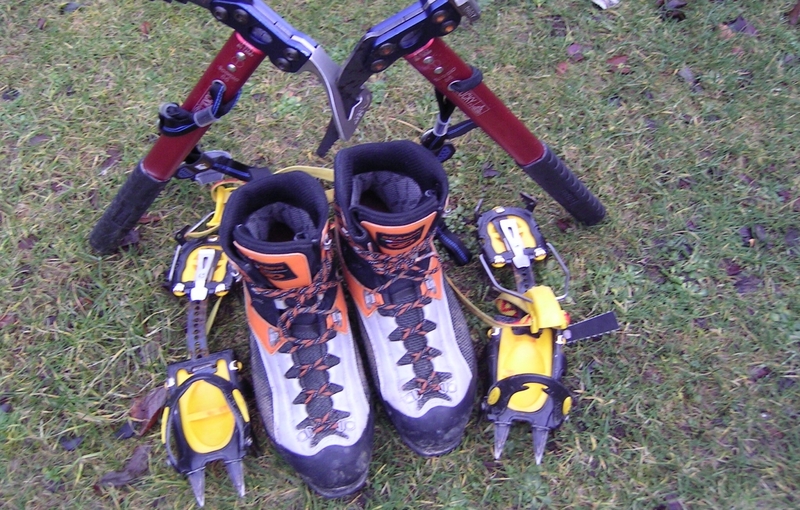 There is a wide range of winter mountain boots (plastic and leather) in store – including some larger sizes; ice axes (walking and technical); crampons (walking & stepins) available for hire. Our winter boots sizes now range from size 4 to size 13. If needed we also have waterproof jackets over trousers, ruc sacs & day sacs plus spare hats & gloves – in case you have forgotten yours! We do not hire out more technical gear such as ropes and harnesses or other hardware for safety reasons. However all technical gear is included in our course prices. If you hiring from us then there is always a refundable security deposit to be paid by cash or cheque only. At busy times it is always advisable to pre-book gear as our own courses will always be a priority. If you hiring from us then there is always a refundable security deposit to be paid by cash or cheque only. At busy times it is always advisable to pre-book gear as our own courses & expeditions will always be a priority.